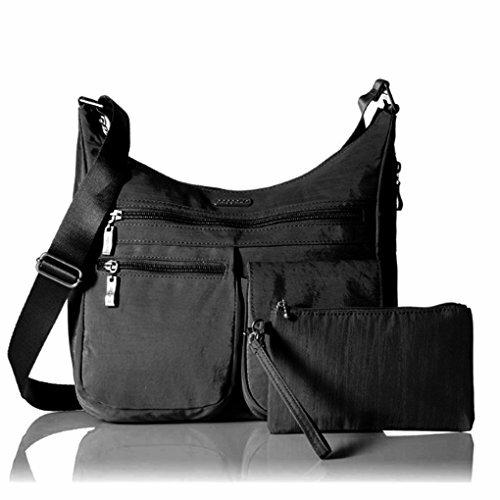 Everywhere bagg Black | What Should I Say? The perfect accessory for an ensemble. This bagg is fabulous, and features two easy-access outside front pockets, an interior with ten credit card slots, a lipstick/pen holder, key fob, and detachable coin purse, and a large stuff pocket on the back with a hidden magnetic closure and a bottom zipper to convert into a sleeve so you can slide the bagg securely over the handle of your suitcase. Includes a 52" adjustable strap and is made of lightweight water resistant fabric. Dimensions: 13.5" x 9" x 5"
Drop Length: Drop (distance from handle or shoulder to top of bag): 36" - 52"